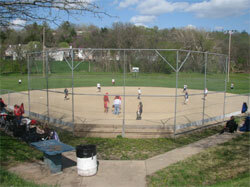 Optimist Park is located at 317 Plymate Lane in Manhattan Kansas. It consists of 3 softball fields, 1 T-Ball field, 3 batting cages and 2 pitching areas. It also has 1 building housing restrooms and a softball equipment storage area plus a 2nd 2-story 2-car garage used for maintenance equipment and storage. For more information on the Optimist Park Improvement Project, download the information brochure by clicking here *. If you would like to donate to the Optimist Park Improvement Project, you may download the Donation Form by clicking here *.